After Breaking Bad ended, we asked Warren Ellis (who has helmed numerous titles for Marvel and DC, created the highly regarded graphic novels Transmetropolitan and RED, and authored the recently published novella Dead Pig Collector) to give his take on the finale. The author — who previously wrote a provocative essay for Vulture about why violent stories matter — graciously obliged with his interesting theory about Heisenberg. Over the last five years, we have watched a small hero become a big villain. The ordinary indefatigability of a clever man who settled for an invisible and honest life slowly metastasized, through buried pride and smoldering self-loathing, into the need to become larger than anything around him. The final episode of Breaking Bad has, like any well-written piece of television, generated many theories as to what actually happened. You can accept any you like. That’s the fun of the game. There’s a great one, spun out by Emily Nussbaum and Norm Macdonald, speculating that Walter White actually died in the car at the top of “Felina” and everything that followed was an edge-of-death hallucination. Walter White did die. It’s stated at the end of the penultimate episode, by Gretchen. Walter White is gone. The final episode is the death of Walter White and the apotheosis of Heisenberg. It’s written on the wall of the old White family home. Nobody wrote “Walter White lived here.” They scrawled HEISENBERG over the plaster. 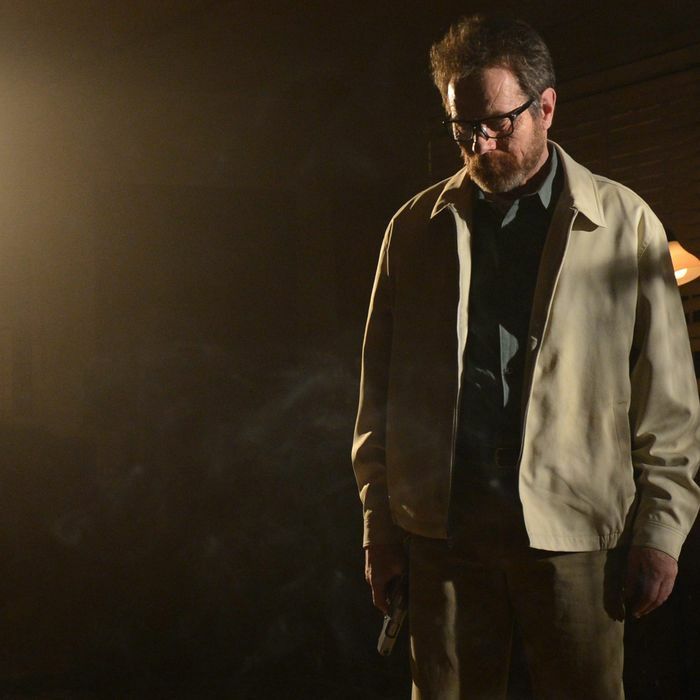 Before he enters Skyler’s new place, Marie tells her that there are reports of him popping up everywhere — but all through the episode, Heisenberg can only be seen when he wishes to be seen. In this last hour, everything he tried and failed to do when he was Walter White pretending to be Heisenberg is restaged, and is successful. He has stopped pretending to be Heisenberg. Or, perhaps, he has stopped pretending to be Walter White. Why does that ricocheted bullet get him right at the very end? Because, faced with Jesse, he throws his old partner to the floor and clear of the fusillade. That’s something Walter White would do, and so Heisenberg gets killed for it. What keeps him alive is being a fictional supervillain. What kills him is being human. We ended where we always knew we would, with Walter White filled with cancer and lying dead before us. But, before he went, we saw him become the criminal mastermind he’d always been accused of being, and perhaps always dreamt of being, and it was horribly glorious. Warren Ellis is the author of Dead Pig Collector and many graphic novels, including RED, which has been adapted into two films starring Bruce Willis and Helen Mirren. His first nonfiction book, on the future of the city and the science-fiction condition we live in, arrives in 2014. He lives mostly in Britain.